I have a new favorite game. It's called Ask Andy What He Wants For Dinner. He'll name a completely random ingredient (in this case, artichokes), and I get to find a fun recipe that makes everyone happy. The result of this round of the game was Shrimp Scampi with Artichoke Hearts. I already spend a lot of time making Ellie Krieger dishes, but I'm skipping out on the next 3 weeks (just not so into the recipe choices), so consider this my peace offering to the group. I don't make shrimp too often, and when I do usually don't wind up loving it (not a big seafood gal in general), but this was definitely a huge success, we devoured it! The flavors came together perfectly, it wasn't too heavy at all, and and it, unlike many of Ellie's recipes, came together in about 10 minutes flat. So here's my tip of the day: I buy those 4-packs of baby pinot grigio bottles and keep them in the fridge. That way, I don't feel like I need to drink a whole bottle of wine when a recipe calls for it (although that sounds like it would be a good time!). And when it calls for 1/4 or 1/3 cup, there's just the right amount left in the little bottle to enjoy while you cook. Total win. I served this on top of some fresh egg fettuccine tossed with olive oil, garlic, crushed red pepper, and some grated grana. Simply divine. Heat the oil in a large skillet over medium heat. Add the garlic and shallots and cook, sitrring, until softened but not browned, 2-3 minutes. 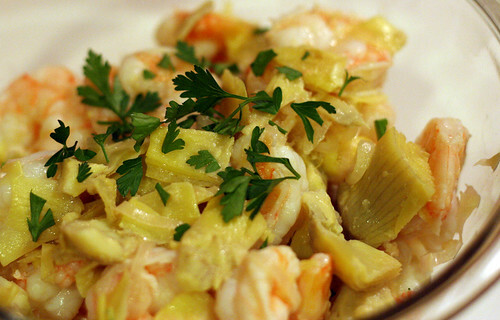 Add the shrimp, artichoke hearts, wine, and lemon juice and cook until the shrimp are cooked through, 3-5 minutes. Stir in parsley, salt, and pepper. Garnish with more parsley and serve. looks and sounds absolutely delicious. One of the things I love so much about shrimp is how quick it is - we also buy frozen shrimp a lot, so we have a really fast protein when we're low on time. The wine idea is very very smart! First of all, that is a great wine tip. Love it! Also, it's so funny that you made this because I was considering choosing it as my pick for a few weeks from now. Either way, I'll be making it soon because it sounds and looks so yummy! Lastly, you should at least reconsider the bbq chicken sandwiches. I have made them before using a rotisserie chicken (so much easier) and I doctor up the sauce a bit to my liking. It's pretty good in my humble opinion. Yummy. We love artichokes and shrimp. I'll give a try! Popped in from Cathy's! This looks lovely! Holy crap this looks like it could be my favorite food and I haven't even tasted it yet! I will be making this very soon! Looks sooooo good. Heeded your advice on the wine and bought the four pack last night for my Giada recipe. Thanks!!! Hold on... I need to know more about these 4-packs of baby wine bottles. I am ALWAYS wasting wine because I cook with it, drink a little, and never finish it. Where do you find them... at any wine-carrying stores? Dinner looks great, by the way! @The Blonde Duck Hi and welcome! Who's Cathy? @Megan I get them at Safeway or Albertson's. Any place that has a good selection of wine should carry them. Wow, looks beautiful! I never had artichokes with shrimps before, but I bet it tastes good. Great idea on getting the smaller bottles of wine! I never thought of that and I think I might start doing that because I pretty much have to finish a big bottle by myself...well, not in one night. haha.